Maxim Gorky's 'Mother' adapted to the stage by Brecht adapted to the Indian context and presented as a musical by Prasanna. The context, in which this production of the play Taayavva is placed, is civilizational. People need a historical course correction, of the civilization itself to survive. People have become completely civilized, completely soft, and completely of the mind. We have rejected, nature, hard labour and the experiential, almost completely. This has caused immense pain to the hard labouring people, the natural people, to the animal life, and to nature itself. But it is not only they who are suffering because of us; we are also suffering because of us. We, the rich, the powerful, and the intelligent are suffering as much deprivation as poor and marginalized. Our cities, our life and the future of our children, are getting wasted. This waste is not just a pollutant. It is a civilizational waste. And it has accumulated all around us. Yet! We fool ourselves that technology can save us, God can save us. We have wasted technology, we have wasted god. This is the context in which we are producing the play Taayavva. Taayavva tries to deconstruct the modern system in her own way. It is a system that divides everything. Taayavva tries to reconcile the opposites and thus deconstruct. She tells the haves to deconstruct themselves, while constructing a better life for the have nots. The haves needs to adopt a harder life she tells, a simpler life. While Gram Seva Sangh was struggling to construct these ideas, a new form of sales tax called GST was imposed on handmade products in India. Indian economy, that had already been beaten up took a further beating. Gram Seva Sangh moved in and raised its voice. Taayavva is an offshoot of that struggle. So it is natural that Taayavva creates a consensus among the contending forces. Taayavva means the mother. We all know, its the mother in any family who sustains consensus. This play is inspired by Maxim Gorkys famous novel Mother. It is also inspired by Bertolt Brechts famous play of the same name. But, Taayavva had to be a new play. For it was written for a new context. To begin with, Taayavva is a widow and is selfish. She is not selfish in a personal sense; she is selfish in a sense. It is a sense of protecting a progeny. Her son becomes an activist, in the cause of the handmade. She tries to protect him. He dies. The police kill him. The mother becomes an activist. In this sense, she is doing exactly what the Mother Nature is doing these days. Taayavva is both, a metaphor and a meaning. The play is a musical, and a celebration. You may ask, what is there to celebrate in such dark times?, Bertolt Brecht the famous German playwright had asked this question in one of his poems. Taayavva celebrates the joy of deconstruction, deconstruction as opposed to destruction. She deconstructs even God. God, for her, is a labouring and hard working metaphor. The play is in a language that is difficult to translate. It is in Kannada, a language that is emotional and experiential. It is their mother tongue. A tongue that is being silenced. They are sure you will be able to understand and enjoy, the sound of the dying music, even if you do not understand the meaning of it's moaning. Pallavi and Bindhumalini explore the theme of gender as they make a journey from birth to liberation; from form to the formless with through the words and the eyes of women across the world. Premiered at Under the Raintree festival, Bangalore. This play is set in the 8th century, in a Matha in a fictional town called Beerpur. It is the time when the Pala kings were ruling the east and large parts of northern India. These kings were Buddhist; Buddhism was at its peak and on the verge of declining. There had been mass conversions to Buddhism.The story revolves around this Hindu temple town which is surrounded by Buddhists. The protagonist is a man called ‘Agnivesh’, a scholar in the Matha.The head of the Matha, ‘Nath Nand’ is soon to retire to the Muktidham to die and achieve salvation. Nath Nand, who has always separated religion from politics, is faced with a choice. Which of his students shall be his successor?Will it be Yuyutsu, who believes in opening up the doors of the temple for the lower castes?Or Agnivesh, who believes in raising an armed resistance to Buddhism? The play premiered on 27th January’2017 at Ranga Shankara , Bangalore, followed by performances in Prithvi Theatre, Mumbai, Vinod Doshi Theatre Festival, Pune, Serendipity Arts Festival, Goa, Safdar Studio, Dehli, Windermere Theatre Festival, Bareilly and a performance tour across Uttar Pradesh. It's a game of survival, in a concrete arena. And the rules are not black or white - its grey, like cement. During a game of hide ‘n’ seek, 3-year-old Murli hides in an auto rickshaw and falls asleep. He wakes up in a different neighbourhood with an angry man shouting at him. But Murli can’t understand him and just wants his mother. The angry man grudgingly sets out to take him back home. This Indo-German collaboration explores the realms of digital dramaturgy, repetition and user choices to create a new hybrid form of theatre-meets-performance art. Andi Otto is a composer and performer of electronic music from Hamburg. 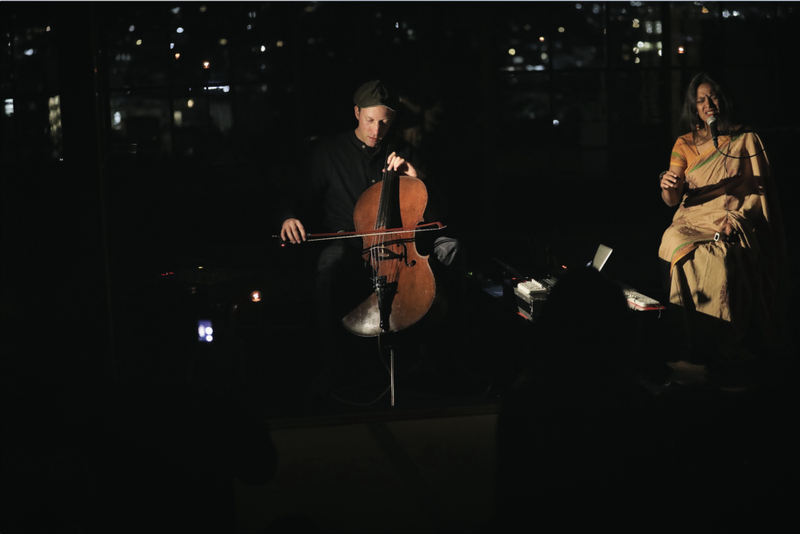 Pallavi and Andi have collaborated on musical albums (Bangalore Whispers, Via, Sowers and Reapers) and have performed in India, Germany and Japan with their duo presentation that is an audio visual performance of gesture music. 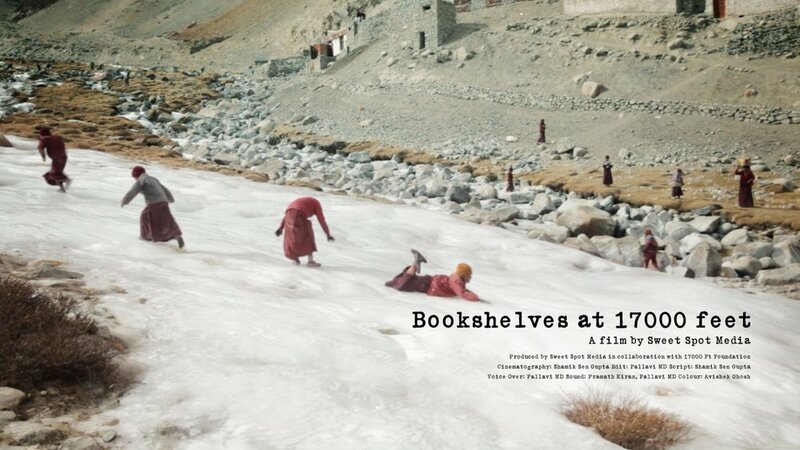 A documentary film about Ladakh's remote village schools, the children studying there and an NGO, 17000 ftFoundation, that's building libraries in these schools. Sweet Spot Media started collaborating with 17000 ft Foundation in November, 2012. We travelled with 17000 ft through five remote villages in Ladakh. In Tukla, Puga, Hanle, Mudh and Skidmang - all scattered over distant stretches of Nyoma block and documented the setting up of libraries for the season. A contemporary music band that explores classical Kannada poetry from Akkamahadevi to Chandrashekar Kambar. This string quartet develops unprecedented perspectives, never seen before, on the music of one of the greatest pop stars of all time. Quartett PLUS 1 plays the expanded six movements of the "American Jesus Suite" (music score by Stefan Wurz) live, in the middle of an interactive installation consisting of video vocals. The staging creates a new form of pop-cultural chamber music full of hook lines and deceptions. A family gifts her a television with a satellite dish antenna in gratitude after she attends to a difficult delivery (for which they even had to bodily remove her from a movie theatre). The arrival of the first color TV in her small island village heralds great changes in the sleepy hamlet. The women in the village begin gathering at her house once the men leave for fishing. However, a few of them stay away, since Gulabi is one of the few Muslims in the village. Yet others prefer to watch from outside her shack, without entering it. Among the regulars at her home is Netru (M.D. Pallavi), a girl with an absentee husband and a domineering mother-in-law, whom Gulabi befriends and becomes a confidante to. But Netru disappears and Gulabi is blamed, leaving her all alone in the village. The Kargil war of 1999 and the rise of communalism in Karnataka provide the backdrop to the film. The communal stereotyping of Muslims following the Kargil War finds an echo in the village. The tension between the small fishermen of the village and a Muslim businessman (who is actually never shown throughout the film) with a growing fleet of commercial trawlers acquires a communal color. The disappearance of Netru adds to the mounting tensions. The Muslims in the village flee and urge Gulabi to leave too, but she refuses and stays put in the village. Her house is vandalized and she is forcibly taken to a boat to leave the island. The young men from outside who spearhead the attack assure the villagers that Gulabi's television would remain in her house. Stumble depicts the new economy, the dot-com bust, stock market scams, mutual funds, and voluntary retirement. "Madhu, in Bangalore and her brother Uday, in America get laid off simultaneously and ponder their next career move. Their careers collide in a dizzying maelstrom of political corruption, business fraud and failed familial expectations. This film glimpses the complex ramifications of the rise and `stumble' of the IT industry in Bangalore. It reveals the insidious nexus of state politics with global capital and traces the seemingly disparate relationship that the software industry has upon mutual fund schemes. Stumble teases out the inter-dependence of the co-operative bank sector and the liberalized economy. Consequently, the film explores the clandestine ways in which the most vulnerable sections of society - in this case, rural farmers - nourish the richest and most powerful people in the world. A failing software concern reinvents itself as a call center - where again third world labor, in borrowed accents, services the first world consumer. Prakash Belawadi, the director, weaves these details into his narrative through an ironic critique. Belawadi clearly reveals the saturation of transnational capital, commodities, images, ideas, information and people in his (and my) beloved Bangalore. This unique moment in the city's life captures the exuberance of a newly emergent middle class. But while many things have changed, many others stay the same. Madhu does not travel to the U.S. with the same ease as her brother. The color of her skin darkens her marriage prospects. The mere presence of a white man bolsters the confidence and diminishing morale of local bank officials. Stumble finishes the story that Bugaboo (1999) started a few years ago. Set in Silicon Valley, Bugaboo chronicles the boom of the dotcom era, seen through the eyes of a skeptical Indian software engineer. What happens when that software engineer gets laid off and scrambles B2B (back to Bangalore) after his American dream failed to deliver? While Belawadi responds to that question, he also poses several others. The film is eminently watchable, especially for the performances of Ashok Mandanna, Anant Nag and Suhasini. While it falters in technique and script, the spirit of the film does not stumble." been making money at the box office. Matinee Horror is an inquiry into the aesthetics of ‘mass’ Kannada films.